Through an innovative partnership with AlphaTRAC, an organization focused on crisis decision training, Near Miss is applying the lessons learned from the experiences of the public safety community, to a new training technology, AlphaACT applications. Each month, AlphaTRAC will offer a free training scenario that focuses in on the key lessons learned identified by the Near Miss Program. How does it work with Near Miss? Based on the decision-making approach most often used by experienced crisis managers, AlphaACT applications employ pattern recognition engines, graphical user interfaces, and a database of scenarios to teach users how to recognize and apply past experiences (their own and those of others) to rapidly changing crisis conditions. AlphaACT® FIRE is a web-based training solution that helps fireground incident commanders improve their decision-making skills in the high stress, chaotic environment of a fire response. Based on the recognition-primed decision model, AlphaACT FIRE helps firefighters learn how to operate under conditions of time pressure and uncertainty, using the decision-making method favored by experienced fireground commanders. The system teaches users how to recognize and apply past experiences to find a solution for the problem at hand. 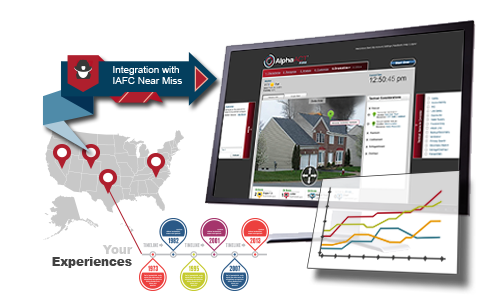 At the heart of AlphaACT FIRE is an extensive knowledge base of firefighter experiences primarily acquired through the IAFC Near Miss program and its experience-gathering system, now powered by AlphaTRAC’s XCapture™ technology. AlphaACT FIRE scenarios will be part of the free training of the month process.